As mentioned in the article “There was Something About Hong Kong Old Mary…”, Chiuchow natives Mary Wong and her son Jimmy Tse of HK Old Mary Sing Shun Co. were pioneers of the export carved wood furniture industry in Hong Kong and Jimmy himself actually served as president of the industry group – Hong Kong & Kowloon Art Carved Furniture & Camphor-Wood Chests Merchants Association (港九藝術雕刻家俬樟木槓商會, hereafter referred to as HKFCMA) – for many years. However, the founding president of the HKFCMA in 1961 and many of the key players in that industry during that period actually came from Shanghai, specifically the city of Dongyang (東陽) in Zhejiang province which had been known for its carved wooden furniture for centuries. From the 1930s through 1980s, these Shanghainese furniture and chest makers through excellent craftsmanship and global vision exported their products all over the world, entering the homes of American families and even Buckingham Palace. Although today most of these firms are no longer active, their products continue to be fixtures in many homes from generations to generations and remain highly valued in the antique furniture market. To tell the story of these Shanghainese carved wood furniture makers, one must start with Dongyang, where many of the craftsmen came from. Dongyang, which is located in the Jinhua prefecture (金華) near Hangzhou, had been famous for its woodcarving since the Tang Dynasty and by the mid Ching Dynasty onwards, its wood carving was very intricate, depicting scenes from famous Chinese folklore and recognized as the best of the four top wood carvings locations in China. During the reign of Ching Dynasty Emperor Jiaqing and Daoguang, hundreds of Dongyang wood craftsmen worked in the Forbidden City palace. With the dawn of industrialization in China, mass production of furniture by Dongyang craftsmen in factories began at the turn of the 20th century and the most prominent of the earliest factories was Ren Yi Factory (仁藝廠) in Hangzhou which was founded in 1896 by the Scottish medical missionary David Duncan Main (梅方伯, 1856-1934), the first enterprise known to mass produce Dongyang furniture and also export it overseas, winning a prize at the Panama-Pacific International Exposition in San Francisco in 1915. By 1920, there were over 30 Dongyang furniture factories in Shanghai, employing over 400 Dongyang craftsmen. Starting from the 1920s, Dongyang craftsmen began to migrate overseas, first arriving in Hong Kong, then Malacca, Kuala Lumpur and Singapore in around 1935 and later Taiwan in 1949. The wooden furniture industry in Hong Kong can be traced back to the late 19th century with You On Company (耀安), which was founded in Hong Kong in 1897 by the Wan family. One of the family members, Wan King-shan (温镜山) was the founding supervisor of HKFCMA and according to Matthew Turner (author of “Made in Hong Kong” and historian of HK industrial design), another family member Wan Sze-yau was a pioneer in adapting Chinese furniture to American taste in order to facilitate exports to the United States and “ideas for new pieces seem to have come directly from American servicemen, who would suggest them to Wan himself”. In suiting the taste of foreigners, the Wan family developed remarkably eclectic products, such as the “altar cocktail bar”,”traditional Chinese telephone table” and the “praying scholar among Chinese clouds with electric light bulb on its head.” You On had stores at 72 Canton Road in Kowloon and Queen’s Road on Hong Kong island and a factory in the New Territories and before the War it was the largest wooden furniture maker in Southern China with over 500 workers. While You On and HK Old Mary were important pioneers, it was the Dongyang craftsmen and Shanghainese merchants who elevated the HK wooden furniture industry to the next level both artistically and commercially. The first Dongyang craftsmen arrived in Hong Kong in around 1924 and as the Sino-Japanese War progressed the total number of Dongyang craftsmen in Hong Kong soon reached 400. As orders flowed in from the West, many of the craftsmen made a decent living and a number of them saved up enough to set up their own shops, with Nee Wuh Tseng being the first one on record, followed by Wah Hing and Wah On Hung Kee. After 1949, major furniture makers in Shanghai such as J.L. George and George Zee relocated to Hong Kong while Shanghainese merchants like Hoi Yu-lei and Percy Yeh established the firms of Cathay Arts and Majestic in Hong Kong. All of these firms benefited from the strong Post War foreign demand for wooden furniture and camphor wood chests, particularly from the US market and American servicemen who visited during the Korean and Vietnam Wars. Since most of the demand was from foreigners (including overseas Chinese), most of the furniture makers had retail outlets in the tourist areas of Tsim Sha Tsui and Wanchai and factories in Kowloon and New Territories. The rise of labor unions in the industry and import restrictions by the US government prompted the industry players to set up the HKFCMA in 1961, which effectively broke a major strike in 1964 by playing the pro-Nationalist unions against the pro-Communist ones. By 1981, Australia and New Zealand also became an important market representing 30-40 percent of exports (up from less than 10 percent) and the high rental costs and retirement of skilled labor from Dongyang forced over half of the industry players to move production from Hong Kong to Macau and the mainland, not just nearby Pearl River Delta but also to their ancestral home of Zhejiang province. In April 2016, almost a century after the first Dongyang craftsmen showed up in Hong Kong and revolutionized the local furniture industry, the first official delegation of wood carvers from Dongyang exhibited their work as part of a showcase of arts and crafts from the Zhejiang province at Victoria Park in Hong Kong. Two of the exhibiting Dongyang masters had interesting ties to Hong Kong, one being Lu Guangzheng who learned his craft from Lou Shuiming, the master carver who worked in HK for Wah Hing and J.L. George between 1948 and 1956 and the other being Xu Jingbin (徐经彬), whose father Xu Jiade (徐嘉德) was one of the original Dongyang craftsmen who followed Chang Hang Hok to Hong Kong and worked as a painter at the original Nee Wuh Tseng factory in Yaumatei in the 1930s. Established in 1930, Nee Wuh Tseng was the first Shanghainese furniture maker in Hong Kong and its founder Chang Hang Hok (蔣恒鶴, 1905-1990) was also the founding chairman of the HKFCMA in 1961 and the Hong Kong Donyang Association (東陽同鄉會) in 1973. A native of Dongyang, Chang started working at the age of 7 when he started out as an apprentice sock maker and tailor. At the age of 14, he learned woodcarving from his maternal uncle and joined the Ren Yi Factory in Hangzhou at the age of 19. The next year, 1925, he joined Wang Sheng Kee (王盛記) in Shanghai. Founded by Wang Shengbin (王盛斌) and his brothers in 1922, Wang Sheng Kee was the leading furniture maker in Old Shanghai and counted Madam Chiang Kai-shek as one of their clients with a flagship store at No. 487 Nanking Road and its factory at Hart Road. (After 1957, the factory was converted to Shanghai Arts & Crafts 5th Factory 上海工藝五廠). In 1930, he moved to Hong Kong and started Nee Wuh Tseng in Wai Ching Street in Yaumatei and won his first contract supplying Chinese furniture to the Peruvian consulate in Hong Kong. He started making camphorwood chests in 1933 which was very popular with foreigners and by 1935 he needed to move into a 10,000 square feet factory in Tai Hang to accommodate his expanded workforce which had increased from 40 to 200 with 70 of them being woodcarvers and the rest carpenters and painters, most of them coming from his native Dongyang. Two of his master craftsmen at Nee Wuh Tseng were his own teacher at Ren Yi and Wang Sheng Kee – the woodcarving master Lu Lian-shui (卢连水, 1884-1961) who later returned to Dongyang in 1954 and Zhang Mingyao, who was later commissioned to replicate an imperial throne from the Forbidden City for the presidential palace in Taipei. When the Japanese occupied Hong Kong in 1941, Chang helped many of his fellow Dongyang natives relocate back to their home town. After the War he resumed his business which operated out of 33 Mody Road in Kowloon and 18 Queen’s Road East on Hong Kong island for many years and was active with leading industry and fraternity groups. After China opened up again in the late 1970s, he was active in re-establishing ties with his hometown of Dongyang and 1986, he established the first individual sponsored scholarship at the Dongyang High School. The second Shanghainese carved wood furniture merchant to set up shop in Hong Kong was probably Wah Hing Company, which was founded in the 1930s by Chen Chai-wah (陳濟華), a native of Guangqiao village (官橋) in Dongyang. He was a founder of the HKFCMA and also co-founded the Hong Kong Dongyang Association with Chang Hang Hok in 1973. Closely involved in both HKFCMA and Dongyang Association for decades with Chen Chai-wah was E.C.H. Chan (陳濟洪), presumably a brother or cousin, who founded Wah On Hung Kee (華安洪記) in 1933 which operated out of 577 Queen’s Road. Wah Hing operated out of 102 Canton Road and had over 100 workers. In 1948, the firm received its highest profile commission when Governor Grantham ordered a camphorwood chest depicting scenes of Victoria Harbor featuring a Chinese junk to be presented to Princess Elizabeth (now Queen Elizabeth II) on the occasion of her wedding to Prince Philip. 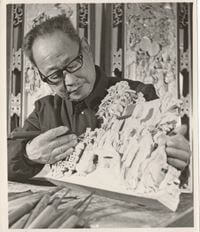 For the job, Wah Hing hired Lou Shuiming (樓水明, 1898-1983), possibly the best master wood carver of his generation. Lou only stayed in Hong Kong for 8 years and in 1956 returned to Dongyang where he played a key role in re-establishing the wood carving industry under Communist rule. J.L. George was one of the leading furniture makers in Shanghai and Hong Kong. According to an article in the New York Times magazine in 1989,it was founded in 1911 although a Chinese source claims that the firm was founded in 1923 by Li Hongfu (李鸿福) and his brother (which would explain the firm’s Chinese name of Shuang Hong Tai, which means “Double Hong Prosperous”). In old Shanghai, its showroom was located at 8005 Avenue Road (now Beijing Xilu). In Hong Kong it operated out of 3 Cameron Road and then later the Sheraton Hotel Shopping Arcade with a factory first located in To Kwa Wan and later in Kwai Chung. In 1963, it also had a showroom in New York at 157 East 57th Street. The Hong Kong firm was Incorporated 1964 but dissolved in 2002. However, there is a “J.L. George Timber” in the city of Conghua in Guangdong province which also has the same Chinese name that boasts 80+ years of history and is currently still exporting furniture to the US market. Like J.L. George, George Zee & Co was another established furniture maker in Shanghai which moved to Hong Kong and found success with American clients. According to one of his clients Chaplain Thomas Parham Jr (who was the first African American captain of the US Navy), George Zee (徐國祥, Xu Guoxiang) originally studied to become a Presbyterian minister at the Princeton Seminary in the US but went into the furniture business in Shanghai in order to support his large extended family in the 1930s. He proved to be a shrewd businessman and was good at attracting Western clients, soon his George Zee & Co (Xu Hai Ji in Chinese) was one of the leading Chinese wood carved furniture makers in Shanghai with its flagship store located at 142 Nanking Road. According to Nathan S.Y. Yuan (阮壽榮) who worked for George Zee in the early 1950s (and who later became the longtime English secretary to high ranking KMT officials such as C.K. Yen and K.T. Li in Taiwan), George Zee left Shanghai for Hong Kong with less than HK$50,000 in cash shortly before the Communists took over and soon like many of his fellow Shanghainese businessmen lost his shirt in gold speculation. However, he was quick to rebuild his fortune by re-establishing his furniture business and was getting six figure orders in US dollars every few weeks from the American armed forces in Japan where the well-known military chaplain Franklin W. Brink was his classmate at Princeton. At his peak George Zee had 3 shops – 122 Nathan Road and the Miramar Arcade on Kowloon side and 79 Gloucester Road in Hong Kong island (there was also a branch at the Hong Kong Hotel at one point) and 2 factories, one located in Mongkok and another one on 500A Castle Peak Road in Cheung Sha Wan which according to Yuan was a “big establishment but the equipment was rudimentary and the management slip shod. There were more than a hundred men in the big yard, hewing, carving and assembling parts all with their hands and there was not a piece of machinery in sight”. Part of George Zee’s success was his emphasis on product quality – every product was meter tested before it left the factory, had a serial number and came with a guarantee that it would never split or warp thanks to his special kiln dried technique. Although his business was very successful, it was not immune to labor issues and in 1951, a strike arose over a disagreement about piecework rates and discontent over measures taken to suppress gambling and to prevent workers from using the factory as sleeping quarters. 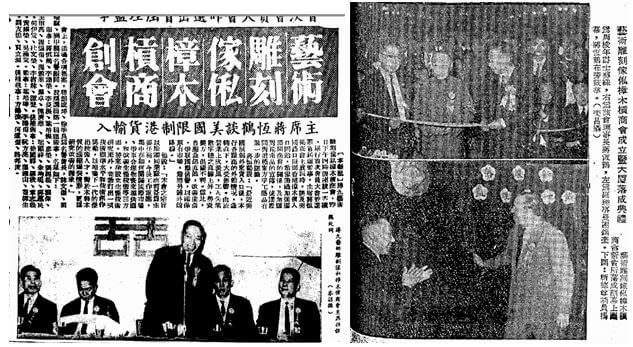 Out of this strike the first union for wood carvers in Hong Kong – the pro-KMT, HK Kowloon Camphorwood Trunk Workers Union, was organized and at its peak in the late 1950s early 1960s it had over 240 members. Within a year, the pro-Communist Wood Carvers Union was also established and soon became the largest group with over 500 members. In response, another right wing group comprised of Shanghai/Chekiang natives was formed with peak membership of 160 in 1955. George Zee died in May 1967 and the management of his business was left to his widow Zee Chang Kam Fung (徐張金鳳) who also served on the board of the HKFCMA. The firm George Zee & Co was incorporated in 1961 and dissolved in 2010. The Original Majestic Company was founded by Percy P.C. Yeh (葉培燦), a native of Yongkang (永康) which is part of the Jinhua prefecture. While he was in Shanghai, he was the owner of a timber factory together with his Yongkang native Shaoju Lu (盧紹稷, who later became a history professor in Taiwan). It is likely that the Chinese name of Majestic – Yeh Kang Kee (葉康記) derived from his last name and the second character of his ancestral home. In the 1960s, the Majestic store was located at Miramar Arcade with its factory located at nearby 74-6, Kimberley Rd. Majestic had many overseas clients who ordered custom made furniture and one of his famous clients was the billionaire philanthropist and chemist Don Othmer, the long-time professor of chemical engineering at Polytechnic Institute of Brooklyn who made his fortune through prudent investments in Warren Buffett’s Berkshire Hathaway. The firm “Original Majestic Company” was incorporated in 1961 but dissolved 15 years later in 1976. It was succeeded by Majestic Furniture (美琪木器) which was incorporated in 1972 and had its showroom at the New World Centre. Percy Yeh was the founding vice chairman of the HKFCMA in 1961 and was still listed as managing director of Majestic Furniture as of 1991. More recently the firm has been managed by Edward Yeh (葉鐵樑). Cathay Arts, a leading exporter of carved wood furniture in Hong Kong, was founded in 1949 by Ningbo native Hoi Yu-lei (夏宇立, 1922-2010). There was a firm of the same name during the 1930s in Shanghai located at the Central Arcade in Nanking Road which might have been attached to one of the firm’s director Yuan Fang-liang (阮芳亮). The firm’s flagship store was at 2A Cameron Road and later relocated to Ocean Centre. According to a 1969 article in Wah Kiu Yat Po, Cathay Arts had around 100 workers and exported 80% of its products. 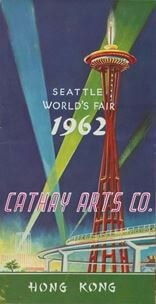 Since exports were such an important part of its business, Cathay Arts was involved in many trade shows overseas including the Seattle World’s Fair in 1962 and New York World’s Fair in 1964. In 1969, the firm participated in a show in Ocean Terminal affiliated with the Hong Kong Festival, the government led initiative to revive the Hong Kong economy after the 1967 riots. Hoi retired to Honolulu and in 2010 died in Burnaby, British Columbia at the age of 88. He is survived by wife Siu Tsin (张秀清) and sons Sidney, Thomas and Samuel (president of the Maryland Institute College of Arts) and daughters Nancy and Liane Hoi. His family donated a scholarship at Chinese University of Hong Kong in his memory. Cooper, Eugene. The Wood Carvers of Hong Kong, Cambridge University Press, 1980. This article was first posted on 3rd October 2016. Are there mailing lists I can get on with topics relevant to this one? Hi Ghvette – unfortunately there is really very limited info on Wah On Hung Kee. Maybe you can email to Hugh who runs the group at indhhk@gmail.com and he can post the pictures of your chest and see if anyone else have more info. I purchased a small hand carved chest today. I am trying to find out information on it. There is a paper inside stating it is a George Zee & Company Manufacturers Export & Retail Office No. 1 Granville Road ( New Road) Main Factory ; No. 500-A Castle Peak Road Kowloon Hong Kong. 142 Nanking Road (Eastern) Shanghai. I have 4 wooden carved nesting tables made by JL George and company. I found the gold logo under the small table but it doesn’t tell me the year they were carved.. They have carvings everywhere on all four tables. The carvings are about the culture of the people who made them. They are a must see. I would like to know the year they where made. Who ever carved them put alot of detail and hard work in these tables. I found them at an antique shop. They are gorgeous. Nee Wuh Tseng’s 10,000 s.f. factory in Tai Hang back in 1935? I have notified York about your comment and hope he will get in touch with you. Let me know if you want to email York directly and I can arrange it. I recently purchased 4 nesting tables and the metal tag inside says H.K. George Co. Art Carved Furniture No. 16 Hennessy Rd. Hong Kong No. 658. I cannot find anything on H.K. George Co. is he also known as George Zee, are they the same person? Would you have any idea when my tables were made? If not do you know how I could find out any information on H.K. George Co. Thank you very much for any information. I appreciate it. I have a pair of horseshoe chairs by Wing Kee Tsui Shum Tai, Kiln dried art furniture, No. 1 Humphreys Ave.